Inventory We are a resale marketplace, not a box office or venue. Ticket prices may exceed face value. This site is not owned by Lucas Oil Stadium . 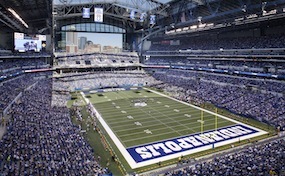 Lucas Oil Stadium opened in 2008 to replace the RCA Dome as the new home for the National Football League's Indianapolis Colts. The stadium was built for $720 million and has a retro historic Fieldhouse look that flows with the city's other venues. The Lucas Oil Stadium box office is located at 500 South Capitol Avenue in downtown Indianapolis, Indiana. The official seating capacity for large events is 70,000. The retractable roof at Lucas Oil Stadium is decided upon 90 minutes before game time and will remain as decided until the game is over. Lucas Oil Stadium tickets have included the 2010 NCAA Men's Final Four, and a Kenny Chesney concert. The stadium is scheduled to hosted the Super Bowl XLVI in 2012 and also the Big Ten Football Championship game on December 3, 2011. StadiumIndianapolis.com is not affiliated with any official website, box office, supplier, or venue. We are an independently owned and operated company that specializes in all events in the secondary ticket market. Prices may fluctuate above or below face value and can change rapidly. To order tickets for all Lucas Oil Stadium Indianapolis events simply pick up the phone and call our operators at anytime or follow the steps online through checkout.